Magnetoresistive random access memory (MRAM) is the forerunning candidate for the next generation digital technology. However, manipulating MRAM efficiently and effectively has been challenging. 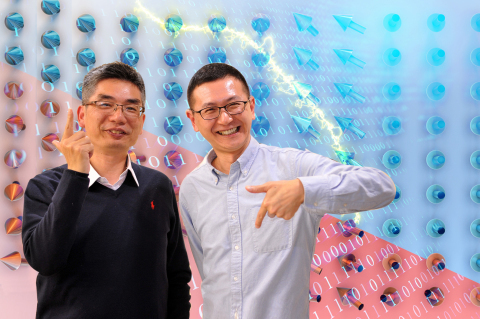 A revolutionary breakthrough was recently achieved by an interdisciplinary research team based at National Tsing Hua University (NTHU) in Taiwan, led by Prof. Chih-Huang Lai and Prof. Hsiu-Hau Lin. By adding a layer of platinum, only a few nanometers thick, it generates spin current to switch the pinned magnetic moments at will – a task that has never been accomplished before. From mobile phones to computers, wearable devices, the Internet of Things, and smart city operations, data processing and storage are essential. To allow faster reading and writing, less power consumption and retaining data through a power outage, MRAM stands out in the keen competitions. Lai and Lin’s breakthrough, published in Nature Materials recently, adds wings to MRAM technology and attracts attentions from both industry and academy. At present, information processing in digital devices is mainly carried out using dynamic random access memory (DRAM), but it consumes significant power and faces serious hurdles when reduced in size. DRAM utilizes the charges of electrons. “But, electrons have both charge and spin.” Lai said, “Why can’t one work with electron spins to manipulate MRAM?” To put the idea into practice, Lai and Lin formed an interdisciplinary research team with doctoral students Bohong Lin and Boyuan Yang. Lin explained that the structure of MRAM is like a sandwich. The upper layer consists of a freely flipping magnet, in charge of data computation, while the bottom layer consists of a fixed magnet, responsible for data storage; and these two layers are separated by an oxide layer. The challenge is to switch these layers of different natures by electrical means. After a long series of experiments, they found the key ingredient: a nanometer layer of platinum. Due to spin-orbit interactions, the electric current drives the collective motion of electron spins first. The spin current then switches the pinned magnetic moment effectively and precisely. In recent years, NTHU has been promoting cross-disciplinary cooperation, such as the MRAM research conducted by the physicist Lin and the materials expert Lai, who have learned to work together seamlessly. Major international companies all participate in the competition of MRAM development, including Samsung, Intel, and TSMC. It’s likely that mass production of high-density MRAM will begin sometime this year, a development where the research team led by Lai and Lin has played a key role. The research team is currently extending their groundbreaking discovery to other structures, and their ongoing findings are expected to have major impacts on the development of memory industry. In Lai’s view, the development of MRAM technology is going to have a decisive influence on the future competitiveness of Taiwan's semiconductor industry.